Thread: Sx chassis e start mod. As many know the electric start vipers xtc vmax ventures and sxr have the ring gear mounted to the primary clutch. Over time it comes loose and wears the clutch pilot where it mounts. 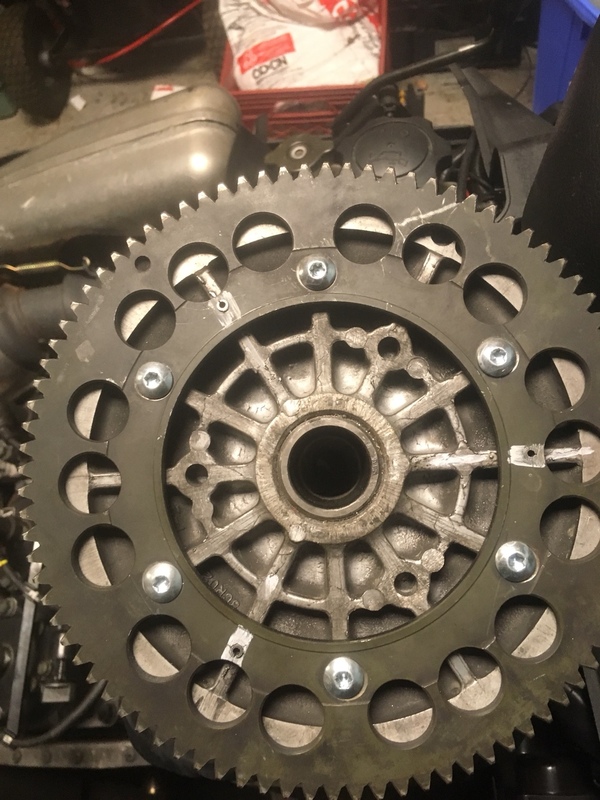 I modded this clutch to use roll pins so that it drives on the roll pins before it drives on the bolts. Clutch balance was checked after install. Now to get it installed and see if it works. gotta try something before i have to buy another clutch for a sled with 3000mi on it. well we had failure this weekend on this sled. i do not know if it was the mod that failed 1st or the primary spring causing the belt to slip making heat to cause the locktight to soften so that the bolts loosened up. have to take it apart this week and replace the less than 1000 miles primary spring that failed with an old one for the riding we have left. Maim what loctite are you using? I had one loosen up with red but never with green. put in new oe yamaha bolts that came with blue locktight applied on them. did not add any. still have to tear it down. Green loctite (sleeve retainer) is the way to go. Held great for years now and I put them through dishwasher once a year and no problem. well new to it clutch is at the machine shop now getting tapped and drilled for the ring gear. going to make 2 of the bolts into drive pins and let the other 4 just hold it on. planning on the bolts at 12 o clock and 6 for the drive pins.